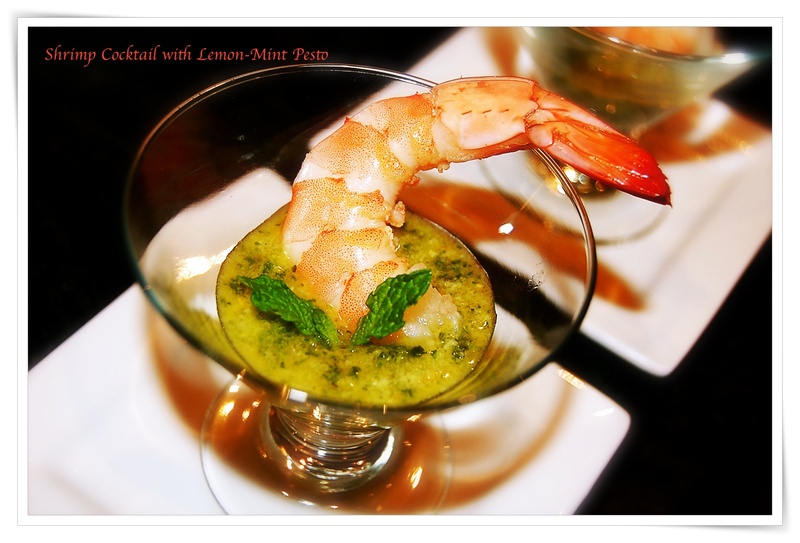 Luckily I live in an area that I can get the freshest seafood and there is nothing better for a quick appetizer than shrimp a two-minute or less cooked shrimp and pesto, perfect for busy nights of decorating and nice as an appetizer for a casual gathering. I have several occasions this time of year to serve this or bring to a party, so light and fresh. Another Ellie Krieger winner! *I used smaller shrimp, just put two more into your mini serving glass or dish. 1. Bring large pot of water to boil. Add shrimp, return to boil, then cook until shrimp are pink and just cooked through, 3-4 minutes. Drain and place in refrigerator to chill completely, at least 2 hours and up to one day. 2. In dry skillet, toast pine nuts over medium-high heat, stirring frequently, until golden and fragrant, about 2 minutes. Set aside to cool slightly. 3. In food processor, place mint, lemon juice, garlic and pine nuts and process until chopped, stopping to scrape sides down once or twice as needed. With processor running, drizzle in canola oil. Add black pepper and pulse a few times to combine. Pesto may be made up to three days ahead and stored in airtight container in refrigerator. 4. To serve, place about 1 teaspoon (5 mL) sauce in each of 32 shot glasses, then set one shrimp on top of sauce in each glass.